EuroLuxe brings style, durability and extended-use solutions to office seating. The EuroLuxe black executive chair provides customizable, all-day comfort to keep you going strong until the last item is checked off your list. Overall Dimensions: 37"- 43"H x 28"W x 29 1/2"L.
The EuroLuxe mesh office chair combines a black mesh back with black fabric upholstery on the seat. 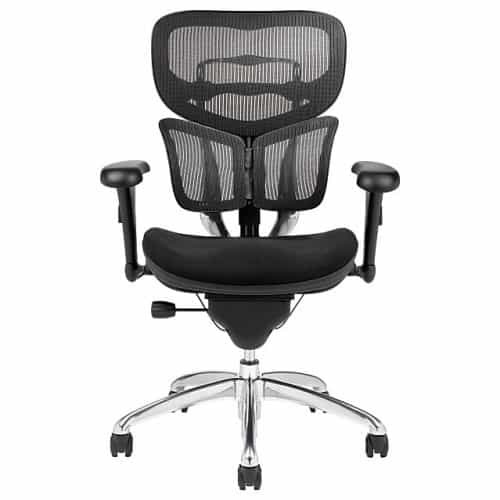 Mesh-back office chair promotes increased airflow to keep you feeling cool and comfortable during a long day. 2-dimensional adjustable arms with pads for added comfort. Cable control mechanism adjusts seat slider. Back height and tilt-tension adjustment. I'm really happy that I took the time to sit down with the employees at Beverly Hills Chairs and have them help me find the perfect chair for my office.